Early look at the cover and title for Mermaid. 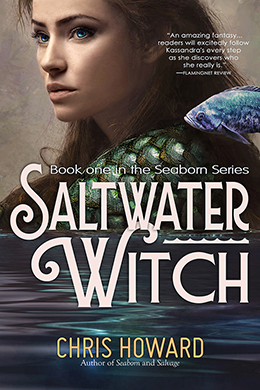 Saltwater Witch Giveaway at GoodReads! Giveaway ends March 08, 2013. How do you eat underwater? Food wasn’t high on the list of difficulties to tackle for a series of books about people from the sea, with at least half the action taking place deep underwater. 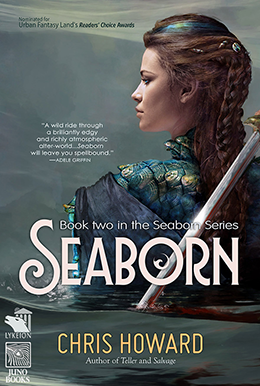 If I divided up my world-building time for the Seaborn books more than half of it would go to undersea combat and the kinds of powers, “bleeds”, magic, breathing, as well as sorting out their limitations, how they are passed to children, and other details. Most of the other half was in cultural development, cities, history, interaction with the surface, social structure, why a people who are apparently successful have such a low population—in the millions. But food proved to be more difficult than combat. Even if there’s magic involved in making things work in a fight, it can be applied to the weapon once. Everyone in battle-space doesn’t need to perform something crazy three times a day in order to sustain their strength and stop their tummies rumbling. Right off the bat I imagined—given their technology and powers—you could reduce friction and drag in the water for edged weapons and bolts from crossbows, and spearguns, so that battles didn’t look like thousands of free-falling astronauts spinning and fumbling in slow motion, taking mad swings at each other. And everyone looking stupid rather than dangerous or fierce. Food wasn’t as easy to figure out. On the surface, Kassandra—the main character—can go to Starbucks or stop in for sushi and sashimi at Shizuko’s in Hampton. She was raised on the surface, but when she gets underwater and sees what the seaborn have out for what appears to be an edible arrangement, she’s disgusted by it. No potato chips, no bagels, no coffee. Just these little lumps or wrapped packages of something she has no need to try. Raw fish, sliced and presented neatly, was an obvious choice because it didn’t require cooking and you could eat it with fingers—it worked underwater. But it was too obvious, too simple, and they can’t live on raw fish alone. In a typical surface kitchen you turn on the stove, you heat water, you make some pasta. In another pot you’re making a sauce. You serve it onto plates and you eat with forks, spoons, knives, chopsticks, sporks, fingers. Easy. In the deep ocean where the seaborn live I was looking at extreme temperatures, complete darkness, with most of the abyss cold, and water around hydrothermal vents reaching 800 F/426 C and NOT boiling because of the immense pressure. I had plumbing in seaborn cities to pipe this water and heat anywhere I wanted, but how do you cook with it? Food wrapped in ceramic containers, leaves? Where do those come from? Firing and glazing clay sounds difficult underwater. The seaborn have light—can make it—and so they can grow seaweeds, hundred-foot tall macrocystis—the large kelp forests you always see in video off the coast of California. Leaves were in, and they’re entirely plausible because that’s a common enough method for cooking on the surface, with food wrapped and steamed inside cabbage leaves, grape leaves, and others. Fish was clearly a center course—cooked or not, with many options for vegetable-like dishes. 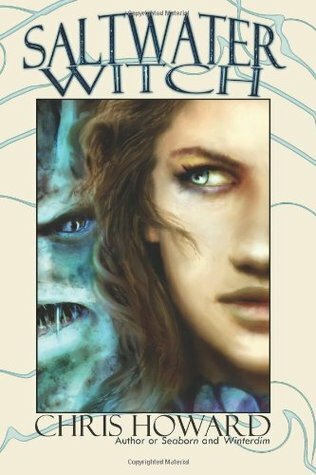 I didn’t take eating much further than this in the three books because food didn’t play enough of a role in the plot, but it surprised me how much trouble it caused—more than breathing underwater, pressure, darkness, and combat, all of which could be handled with sufficient technology—or magic. Looking back, I wish I had given eating—especially the social aspect of gathering around food and drink—more thought. My logic went something like dolphins don’t know thirst and they don’t drink anything their entire lives, so why would the seaborn? I went with a limited approach to developing their eating conventions and left it at that—with some jabs by Kassandra and others about how unappealing their food was. Overall it was the complexity around something as simple as what do you eat underwater that got me. The ocean’s a complex environment made up of many layered environments, and many are radically different meters apart. And stories set there have to deal with the environment. Even with something as complex as underwater acoustics, with negative thermoclines and capacity for changing over long distances I just had to do my research and let it play. Sound travels almost five times faster underwater than it does through the air, but apparently there’s no fast food in the deep. At least I didn’t find any. Saltwater Witch Chapt 13, page 2 is up! Sorry, I've been writing like a demon over the last two months--finishing up the first book in an all new Seaborn series, and haven't even picked up a pencil to do more than a couple quick sketches. Here's a look at today's progress, from sketching, coloring, to the link to chapter 13. Hope you like! Check out all the chapters of the Saltwater Witch comic here. The end! 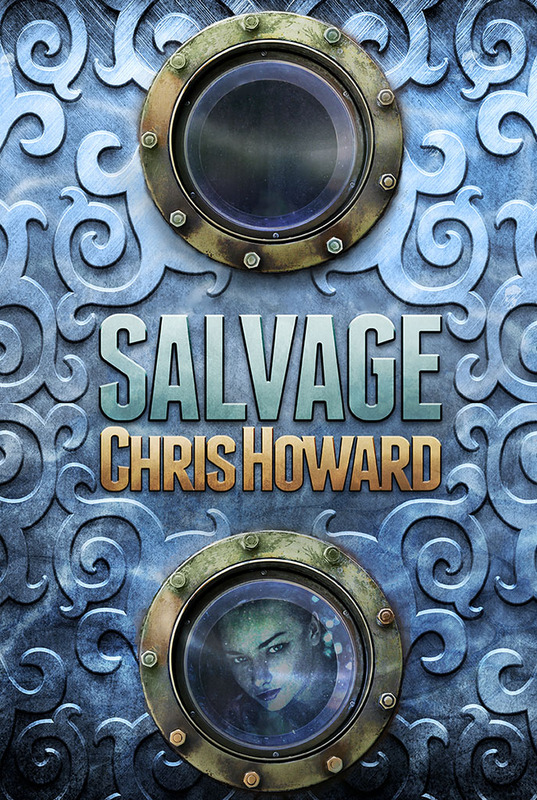 Finished another book, fifty-two chapters, a little under a hundred thousand words, working title is Salvage. This is another Seaborn book--the first in a new series, sort of a tech-thriller/fantasy cross-over, if you can imagine that. The plan is to let it sit, steep like bad tea for a month, do one more edit pass, and get the manuscript to my agent mid-January. We'll see where it goes from there. In the meantime--although I'm tired, I am clearly not too tired to cook up some fun cover art for this one. Hope you like! Giveaway ends December 08, 2012. I built another app over the weekend. This is one of those things that’s been in the back of my head for a couple years. I just thought it would be cool to make a mobile app that goes along with my book Teller, with a complete usable tarot—all 78 of the original 1909 Rider-Waite tarot deck, the most popular deck in the US. I also wanted the ability to identify the cards, the meanings, reverse meanings, and other interesting stuff from A. E. Waite’s “Pictorial Key to the Tarot” (published in 1911). 1. Complete deck, majors, minors, with the ability to shuffle, deal any number of cards. 2. The ability to move the cards around easily—the ability to use any spread you want, with a slidable background/tabletop with enough room for big layouts (see the 7-card spread in the screenshots). 4. Some gesture driven functions, like press-hold to bring up the help for any individual card with meanings for upright, reverses. 7. Going to add some art from Teller. Some screenshots. What do you think? I was looking at the amazing 2012 election maps created by Robert J. Vanderbei (Princeton) and Mark Newman (Department of Physics and Center for the Study of Complex Systems, University of Michigan), and although there is a very interesting blended voting map (Most of the country is some shade of purple, a varied blend of Democrat blue and Republican red) what I really wanted was this blended map with a population density overlay. Because what really stands out is how red the nation seems to be when you do not take the voting population into account; when you do so many of those vast red mid-west blocks fade into pale pink and lavender (very low population). So I created a new map using Mark’s blended voting map based on the actual numbers of votes for each party overlaid with population maps from Texas Tech University and other sources. What America Looks Like by Chris Howard is licensed under a Creative Commons Attribution-ShareAlike 3.0 Unported License. If this looks like I'm creating a new post to point to the last one, well, you're right. GoodReads pulls my posts and puts them on my profile--which I love, but there's a bunch of css at the top of the round table post and it's showing up as text on GoodReads. This one won't! They're not waterproof, but they are official Bicycle Playing Cards. I imagine a game would go pretty well for players who happen to like Kassandra. The real question is what would Kassandra's game be? Poker, blackjack, go fish? A game with extremely high stakes? This isn’t about whether or not we’re going to have or how often we’re going to be reading eBooks in the next few years, because I assume that’s been thoroughly answered to everyone’s satisfaction. This is a little view into what they may look like in the next few years, focusing on one cool feature: pop-up glossary or footnote data inside your books. Before you run off saying this isn’t for fiction, think about how often you’ve been in the middle of a complex SF or fantasy novel and wished for a f**king character list—especially when half the character names seem to start with the letter K! With science fiction you’re dealing with advanced technology that may require a little optional background info—selectable or ignored at the reader’s choice. Choice is always good, but clarity and one click away from answers is...priceless. Let me walk you through it and then you decide if this is for you and your books. I’m going to begin with the end and show you what it looks like first, along with a sample chapter you can read and use in iBooks to see what’s going on. I built a prototype web app that automates adding the pop-ups to your EPUBs. The app takes an EPUB page (good old HTML with some new bits in it), lets you add descriptions for characters, places, events, and then adds the code, references, and pop-up functions into the page. If all goes well you should be able to drop this into your ePub file and load it up in a reader that supports the type:epub attribute (e.g., iBooks 2.0 and higher). Screenshots and a link to the builder below. Here's the working example of Seaborn I built with the web app I made. Download it and view it in iBooks or other EPUB 3 reader, or just hit this page with your iPad and click the link. You should get an "Open in iBooks" dialog and then you're set. Here’s the link and—below it—a walk-through of the app that I made to generate the EPUB with pop-ups. Keep in mind that this is pretty experimental right now. The parser for the nouns and phrases is very simple, and the find/replace operations don't take into account words or phrases inside other words and phrases—so a link for "Atlantic" will also be dropped into the link for "Atlantic Ocean". Okay, that's it for now. Let me know if you find any of this useful, how it can work better, all that stuff. Leave a comment! Big thank you to Liz Castro for her post on pop-ups in EPUB 3 at Pigs, Gourds, and Wikis. Other things I was thinking about: EPUB is broken up into one file per chapter, section, or some kind of logical text break. So, you can have different text for the same word or phrase in different chapters, which allows you to reveal just enough info about a character without revealing too much and spoiling the plot or suspense. Also, wouldn’t it be nice at some point if you could turn links on or off? If you’re writing short stories or books—and let’s face it, who’s not?—I have a few tools for you, character name generators (contemporary and Seaborn names) and a word pair list generator, all of which I use for my own work. One of the greatest things about fantasy and science fiction as a genre is that so many F&SF readers are also writers. I don't think you'll find that in thrillers, murder mysteries, romance, or anywhere else. The contemporary name generator lets you create a list of male or female names. Same goes for the Seaborn Name generators, except that they're all ancient Greek names, male and female. The word pair list is a way to spark ideas. Sometimes when I'm stuck in a plot I will pull random words out of the dictionary--usually nouns--and play with the ideas, see how the story would change if I introduced poison, or make one of the characters a really good cook, or take a word like "chronograph" and it makes me wonder what would happen to the plot if there was a "ticking clock"--a count-down timer on a bomb, or the bad guys are going to kill someone at a particular time and the protagonist has to do something extraordinary in order to prevent it. The words are there to feed the story with new and unexpected ideas. It's not quite the same, but think of it as something like Brian Eno's Oblique Strategies, except for writing instead of music. (http://en.wikipedia.org/wiki/Oblique_Strategies. There was a cool "Oblique Strategies for Authors" panel at the last Readercon led by Glenn Grant with panelists Gavin Grant, Eric Van, Jo Walton, and others). This just kicked off at GoodReads for readers in the US, UK, Australia, and Japan! Enter to win. It's free! Giveaway ends October 01, 2012. Kassandra with her scale armor coming apart and floating away. I worked on this last night, finished up the type for some prints over lunch today. It's actually a good sized piece, about 26 inches tall. Check out the full-sized image, because it looks a bit fuzzy in the reduced size.